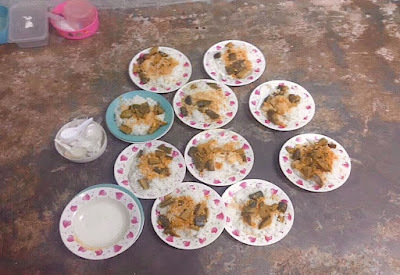 "Nasty looking rice and foul smelling broth with a few bones in it, same as dinner. Sometimes you might be lucky and get a piece of chicken attached to the bones.."
Is the food in Koh Samui Prison like this? Samui is better. Sometimes it can be like this, but you can also order food from the shop. You can order many different kinds of food from the shop, it's not too bad. It's not easy (you have to queue for up to 2 hrs to order) but a 'local businessman' provides a service and will queue for you, for a fee. What do they have? Chicken and rice? All kinds of Thai food... and burgers and pizza. The captains' wives make the extra food. Once they asked everybody to write down what we liked and now they will make it for us. OK quality, 40 baht. 60 baht if you can afford to order with the queue service. Can you write down the menu from the shop? You can order real Birthday Cakes, any size. Haha, gourmet dinner. And I thought you guys were eating rice and fish heads. Amazing. Good news. Families will be happy to hear that, thanks for the info! Samui Prisoners Support group visits the prison regularly to buy supplies.